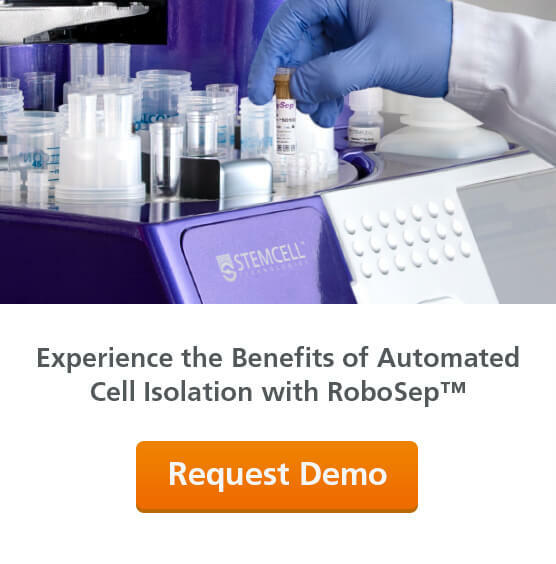 Streamline your cell isolations using the fully automated RoboSep™ cell isolation instruments. The RoboSep™-S and RoboSep™-16 cell separation instruments offer true walk-away automation while retaining the speed and simplicity of EasySep™ with as little as 5 minutes of hands-on time. Why Use RoboSep™ Cell Separation Instruments? FAST AND EASY. Isolated cells are immediately ready for flow cytometry, functional studies or other downstream applications. VERSATILE. Virtually any cell type can be isolated from a wide range of sample sources and sizes using positive or negative selection protocols. EFFICIENT. 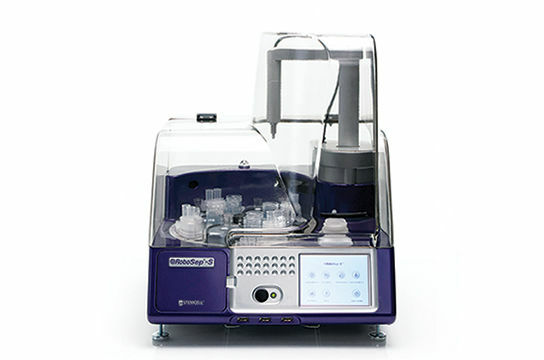 Perform sequential or simultaneous cell isolations from up to 16 samples. SAFE. With a column-free design and minimal sample handling required, the risk of exposure to dangerous pathogens is minimized. FREE FROM CROSS-CONTAMINATION. Disposable tips and a column-free system eliminate the risk of sample cross-contamination. HIGHLY CUSTOMIZABLE. For special or non-standard applications, our experts can work with you to design customized cell separation protocols to isolate cells of interest. EASY TO MAINTAIN. No daily washing or decontamination is required. 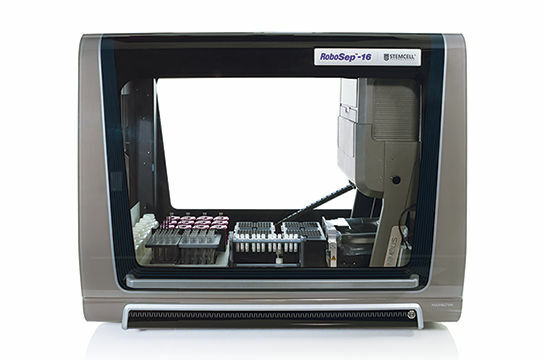 By combining an exceptionally compact design, a simple, user-friendly interface and the fast and easy cell separation protocols you’ve come to expect from STEMCELL Technologies, RoboSep™-S fits easily into the workflow of any lab that needs the multi-sample processing capacity, speed, reliability and convenience of automated cell isolation. Place multiple units side-by-side in biological safety cabinets or on lab benches and perform simultaneous cell isolations for up to 4 samples or sequential isolation of up to 4 cell types from the same sample. Simply select your protocol, load the samples and reagents, press “Run” and return in 25 to 60 minutes to collect your separated cells. This case study describes a method used by the Florida Tissue Typing Laboratory to sequentially isolate B cells, T cells, myeloid cells, and NK cells starting from a single sample of HetaSep™-treated blood for their chimerism analysis. New ex vivo models enable a closer approximation of the in vivo environment than traditional in vitro approaches. Here we highlight four publications that employ a variety of ex vivo models to gain deeper insight into the dynamics of HIV infection. Watch a series of videos that provide an overview on how to use and maintain your RoboSep™-S automated cell separation instrument. Hamilton MJ et al. (2014) Macrophages Are More Potent Immune Suppressors Ex Vivo Than Immature Myeloid-Derived Suppressor Cells Induced by Metastatic Murine Mammary Carcinomas. J Immunol 192(1): 512–522. Jiang D et al. (2014) MicroRA-155 controls RB phosphorylation in normal and malignant B lymphocytes via the non canonical TGF-β1/SMAD5 signaling module. Blood 123(1): 86–93. Joly MS et al. (2014) Transient Low-Dose Methotrexate Generates B Regulatory Cells That Mediate Antigen-Specific Tolerance to Alglucosidase Alfa. J Immunol 193(8): 3947–3958. Chirullo B et al. (2013) A candidate anti-HIV reservoir compound, auranofin, exerts a selective “anti-memory” effect by exploiting the baseline oxidative status of lymphocytes. Cell Death Dis 4: e944. Treppendahl MB et al. (2012) Allelic methylation levels of the noncoding VTRNA2-1 located on chromosome 5q31.1 predict outcome in AML. Blood 119(1): 206–216. Ndhlovu ZM et al. (2012) Elite Controllers with Low to Absent Effector CD8+ T Cell Responses Maintain Highly Functional, Broadly Directed Central Memory Responses. J Virol 86(12): 6959–6969. Narumi K et al. (2012) In vivo delivery of interferon-α gene enhances tumor immunity and suppresses immunotolerance in reconstituted lymphopenic hosts. Gene Ther 19(1): 34–48. Arendt BK et al. (2012) Increased expression of extracellular matrix metalloproteinase inducer (CD147) in multiple myeloma: role in regulation of myeloma cell proliferation. Leukemia 26(10): 2286–2296. Munthe-Fog L et al. (2012) Variation in FCN1 affects biosynthesis of ficolin-1 and is associated with outcome of systemic inflammation. Genes Immun 13(7): 515–522. Bae J et al. (2011) Identification of novel myeloma-specific XBP1 peptides able to generate cytotoxic T lymphocytes: a potential therapeutic application in multiple myeloma. Leukemia 25(10): 1610–1619. Haefliger S et al. (2011) Protein disulfide isomerase blocks CEBPA translation and is up-regulated during the unfolded protein response in AML. Blood 117(22): 5931–5940. Sáez-cirión A et al. (2011) Restriction of HIV-1 replication in macrophages and CD4 + T cells from HIV controllers. Blood 118(4): 955–964.